Food and drink fascinate me as much as books and music. Next week the food storytelling and reading series I co-host with Kimberly M. Wetherell holds its third full-fledged event at Housing Works Bookstore & Cafe in Manhattan. 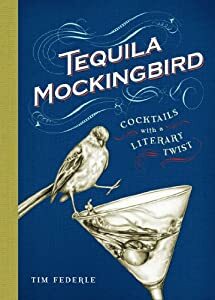 I am especially excited about one of our guests, Tim Federle, whose new book Tequila Mockingbird: Cocktails with a Literary Twist is both entertaining and hilarious, the perfect gift for the literary cocktail aficionado. Speaking of cocktails, my co-host Kimberly Wetherell has just started selling her "Lick'r Lollies," lollipops infused with Brooklyn-distilled booze. Flavors include Beer, Sorel, Root, Gin & Tonic, Manhattan, Margarita, and Lemondrop, and I am giving away an assortment of each. How much do I enjoy Kimberly's liquor-infused pastries and confections? I almost always leave bakeries and confectionaroes with the the thought, "Kimberly would do that so much better." For a chance at winning the book and lollipops, leave a comment pairing a book with a drink (it doesn't have to be alcoholic). My choice? Philipp Meyer's novel The Son with a double shot of cheap rye. The winner will be chosen randomly at midnight ET Friday evening (July 5th).